Admittedly, we write a lot about gardening in the northeast, which makes sense when you consider that we’re located in upstate New York (generally zone 4-5, depending on the elevation). However, we recognize that many of our customers are fortunate enough to live in climates mild enough for an extended gardening season, allowing you to grow vegetables throughout the winter. In nod to you lucky folks, following is a beginner’s guide to growing winter vegetable crops in zones 7-10. As a starting point, we’ll focus on vegetables—and herbs—that can tolerate cool winter temperatures. And, obviously, since there is great variability in fall temperatures between zones 7-10, you’ll have to use your best judgement to decide when, exactly, to plant your seeds. Changing weather patterns make traditional planting schedules unreliable; your local cooperative extension service might be able to help. The important point is that you want to give the seedlings time to establish themselves before the first hard frost, which is usually 8-10 weeks. On the other hand, you don’t want to plant cool weather crops too early because they won’t germinate effectively in the heat. We provide a list of cold-hardy herbs and vegetables below, but keep in mind that local conditions (elevation, rainfall, wind, etc.) will affect your crops differently, as will the exposure where you’ve planted them in your yard. Ideally, you would plant a winter vegetables in the sunniest spot available. One of the biggest challenges of growing crops in winter is that daylight is in short supply, causing many plants to grow more slowly than they do in summer; maximum sunlight is important. Waning daylight is another reason to ensure your young plants are established before winter begins in earnest. Experienced gardeners recommend planting vegetable crops—but particularly winter vegetable crops—in raised beds. This is especially important If you live in a rainy climate, as the raised beds allow for effective drainage. Plants hate having soggy roots! Raised beds also make it easier to cover your crops to protect them during cold snaps—an important point for those of you in zone 7. On the flip side, plants in raised beds can dry out more quickly than those in the ground, which requires vigilance in watering during dry periods. Compost-rich soil is particularly important for winter vegetables, as is a healthy layer of mulch. Don’t add fertilizer when you plant your seeds; wait until the seedlings’ true leaves appear. Then apply a long-lasting organic formulation that’s not to heavy on nitrogen (which makes plants more susceptible to the cold). Any kind of mulch will do; many experienced gardeners swear by dead leaves gathered during fall clean up or straw. With edible crops, it’s always a good idea to plant in waves—particularly with green leafy vegetables—so you’re ensured an uninterrupted harvest throughout the winter. Just be sure not to leave the protective covers on too long, once the freezing threat has passed, as plants need air circulation in addition to sunlight to grow! It may also be necessary to protect your young plants from intense rainstorms in certain regions of the country. 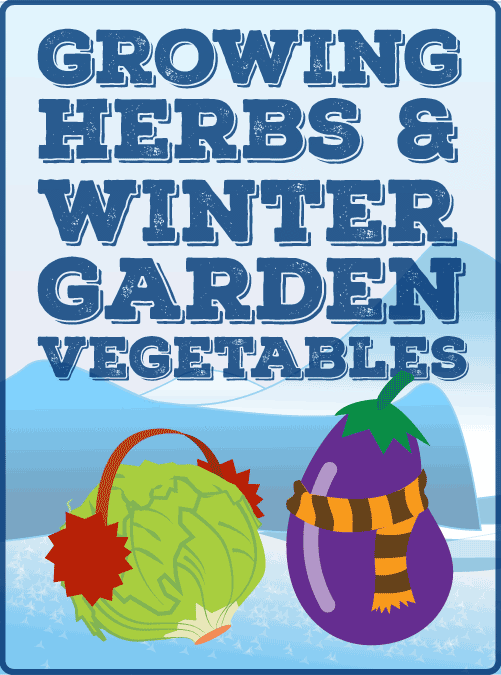 Of course, those of you in cooler USDA zones can trying growing these winter vegetables as well—many gardeners do—but it requires much more effort and vigilance to keep the plants safe during the sustained cold periods common in northern winters. You would need to construct semi-permanent cold frames or hoop houses to protect your crops not only from the cold and wind, but from potentially heavy, damaging snow. Cold weather gardening in the northeast is definitely not for the faint of heart. The rest of us will get vicarious pleasure thinking about those zone 7-10 winter garden crops you “southern folk” are able to grow.